Brushing is the foundation of a healthy mouth. Most dentists recommend that patients with veneers use a non-abrasive brand of toothpaste with whitening agents. This will help to prevent scratches and other forms of damage. Flossing is just as important as brushing. That being said, improper flossing can chip away at a veneer’s surface. Ask your dentist for tips on how to properly floss. Using a good name-brand mouthwash or dental rinse is always helpful. However, products with high concentrations of alcohol can loosen veneers over time. So stick with alcohol-free formulas instead. Reduce your intake of sugar. Many of today’s artificial sweeteners are not only tasty, they’re friendly to your teeth as well as your waistline. Snacking on fresh fruit is a delicious natural alternative that’s worth considering. Limit consumption of beverages like soda, tea, coffee, and wine, which can discolor your natural teeth and may even affect veneers. Avoid cigarettes and other tobacco products. Not only can they damage your veneers, they can harm your health in countless other ways. Talk to your doctor about medications that can help you kick the habit. Avoid chewing on non-food items. This can include anything from your fingernails to a ballpoint pen. In fact, this is good advice for anyone, whether or not they have veneers. Schedule periodic visits with a cosmetic dentist in Fort Worth for polishings, cleanings, and oral health checkups. If you grind your teeth, then speak to your dental professional about prescribing a mouthguard or similar solution. Continued teeth grinding will not only damage your veneers, it can cause health problems such as migraine headaches and back/neck pain. 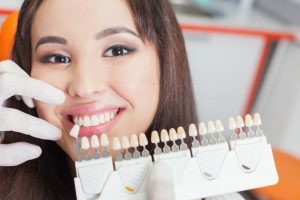 How Long Should I Expect My Veneers to Last? Porcelain veneers can last up to 15 years with proper care. Think of them as part of your body. The benefits you get out are in direct proportion to the effort you put in. Following sound health and fitness guidelines will pay off in all kinds of ways, from a brighter smile to better health overall. So follow your physician’s advice regarding diet and exercise, get plenty of rest, and avoid stress. Last but certainly not least, congratulations on your new veneers! You’ve taken an important step towards achieving your personal goals. Keep up the good work and you’ll look back on this decision as one of the best you’ve ever made. Dr. Renée Corbitt is a Texas native who loves the Lone Star State and its people. She earned her DDS degree from the University of Texas Health Science Center in San Antonio in 1986. When she’s not working, she enjoys reading, taking care of animals, and traveling. You can reach her via her website or by calling (817) 294-8821.